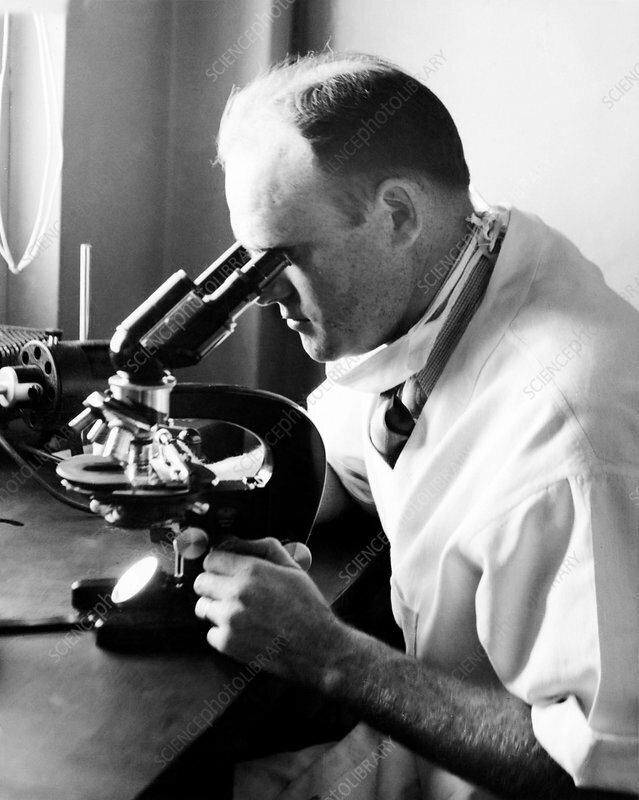 Herald Rae Cox (1907-1986), US bacteriologist, using a microscope in his laboratory. Cox joined the US Public Health Service in the 1930s, working as a bacteriologist at the Rocky Mountain Laboratory in Hamilton, Montana, USA. He and his colleagues worked on diseases such as Rocky Mountain spotted fever and other tick-borne diseases caused by pathogens such as bacteria. The Coxiellaceae and Coxiella microbes are named in his honour. Cox later worked on polio vaccines and cancer immunology. Photographed at the Rocky Mountain Laboratory in October 1938.